Purpose of this Forum. 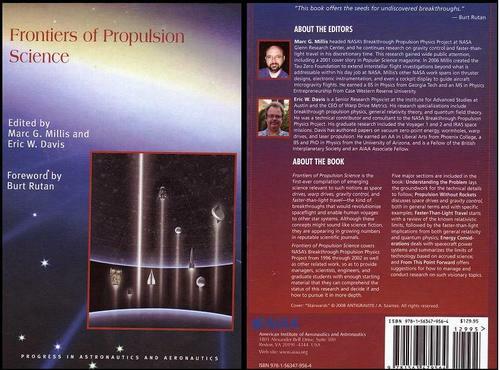 This forum will serve as my notes on the textbook, Frontiers in Propulsion Science (Edited by Marc G. Millis and Eric M. Davis; published by the American Institute of Aeronautics and Astronautics, Inc.). The book, hereafter referred to only as The Textbook, provides the most up to date information for engineering physics as it relates to spaceship propulsion. Originally I posted questions (highlighted in red) to pursue at Embry-Riddle Aeronautical University where I earned a B.S. in space physics. However, it only took me 5 semesters to earn my B.S., and much of that time was spent researching the density of the Martian atmosphere. This means that some of the questions remain to be addressed even though I now have my PhD in physics with a specialization in Computational Condensed Matter Theory . My notes are broken up into sections that match the chapters of The Textbook, with links to the chapter notes in the table below. Comments and/or corrections to my notes and questions by the AIAA textbook authors or other knowledgeable authorities are most welcome and will be published in the appropriate sections unless they are of a private or potentially classified nature.